"Brothers plan native cable system"
OHSWEKEN - Two brothers from Six Nations believe technology may be the key to retaining native values and languages. Jeffrey and Gary Thomas have worked four years to bring a native-owned and run cable television company to the reserve. Their application for a licence is now in the hands of the Canadian Radio-television and Telecommunications Commission - and they're anxiously awaiting the outcome. Gary says the project could be extremely important for the community. "I look at myself for example," said the 36-year-old Onondaga man. "I've totally lost contact with my native heritage. Growing up in Buffalo, I wasn't exposed to it as much as I had wanted to." Now he says he might not feel comfortable taking a beginner's language class, but he would still like to learn his language. He hopes the cable company could fill the gap for people like him through a community channel, which would provide language lessons and other programs relevant to Six Nations. Jeffrey agrees with his brother. "We could do some of our political problems, the Great Law, sporting events, local advertising - anything." He would like to set up a board of directors for the community channel and encourage as many people to get involved as possible. Volunteers could help with the filming, editing and writing. The station would also generate paid employment, said the 35-year-old father of six, who expects he will need about three people to get started. 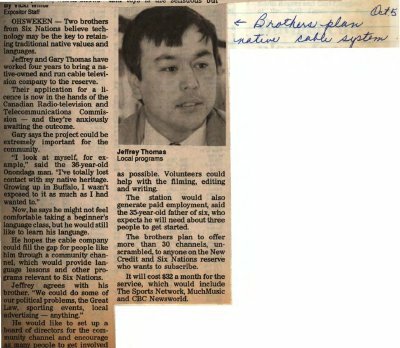 The brothers plan to offer more than 30 channels, unscrambled, to anyone on the New Credit and Six Nations reserve who wants to subscribe. It will cost $32 a month for the service, which would include The Sports Network, MuchMusic and CBC Newsworld. Thomas, Jeffrey ; Thomas, Gary. Canadian Radio-Television and Telecommunications Commission ; The Sports Network ; MuchMusic ; Canadian Broadcasting Corporation.